When my youngest daughter graduated from high school in June 2007, I had promised her a quilt for graduation, following in the "tradition" of what I had done for her oldest sister. Well, Rene didn't really WANT a quilt per se; she prefers comforters. 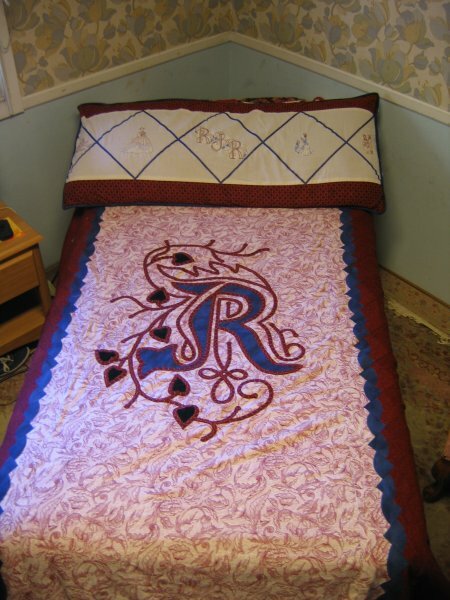 In fact, she REALLY likes the Beauty & the Beast comforter that she has had since she was very young. We came to a solution: I would make a duvet cover for the comforter ... that way I get to make something new for her and she can retain her beloved comforter. From a long-distant quilt show, I had purchased a set of Quilted Letters Alphabet" by H.D. Designs. 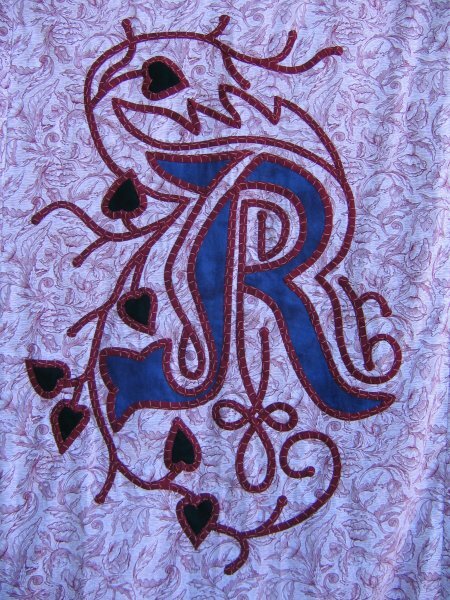 These are FABULOUS designs: letters reminiscent of illuminated letters in medieval manuscripts and Celtic knotwork. When fully enlarged from the pattern, these letters are 2'x3' (yes, 24 inches by 36 inches!) ... absolutely the perfect size to be the focus of a bed covering. For this size, you need to enlarge it 400%, so I took the appropriate letter page to FedEx-Kinko's, where they can do that size enlargement. (If you don't have a copy shop nearby, there are instructions on how to manually enlarge the designs using the grid method.) While I did the scroll work design with bias, the packet includes instructions for alternative ways to achieve the same look-and-feel. I found a deep red on white toile (Rene adores toile) that is used as the center panel. A highly contrasting fabric is used as the side panels and to help bridge the seam between the two fabrics, I used one of my favorite accent pattern .. Drunkard's Path on point. (Note: I have never liked any of the traditional Drunkard's Path layouts. They simply do not speak to me. However, in a class I took for another project, the instructor used the Drunkard's Path block *on point* as an interior border. Oh. My. Gosh! What a difference orientation makes! I loved it instantly.) Home dec cording is used as the filling for piping, which I put all around the edge; it's in the same same deep blue as the Drunkard's Path block. I couldn't find a wide backing in the solid navy that I originally wanted so I substituted a blue on white vaguely "toile-like" fabric. Because it wasn't a wide fabric, I had to use two lengths ... but instead of simply seaming the backing fabric down the middle, I created side panels with a contrasting flap inserted in the seam. I used a 30" home dec zipper as the bottom closure. In this manner, the duvet cover is completely reversible. The contrasting side panels of the front were to be a deep rust with "gold" lattice work. This fabric was to be used for the contrasting side panels, the bias for the Celtic work and in the Drunkard's Path blocks. I cut the rust lattice fabric, reserved the side panels then made yards of bias to do the Quilted Letter design. However, (yes, you are anticipating a shoe dropping at this point), when I bought the fabric, lo those many years ago, I didn't have a layout in mind. This makes is extremely difficult to estimate how much yardage to buy. Turns out I had 2-1/2 yards. This was enough for the length of the duvet side panels. It was even enough to use some for the bias. But it was NOT enough to make all the Drunkard Path blocks that I needed. This was really a problem because I had ALREADY FINISHED all the Celtic bias work and I was NOT going to undo it. 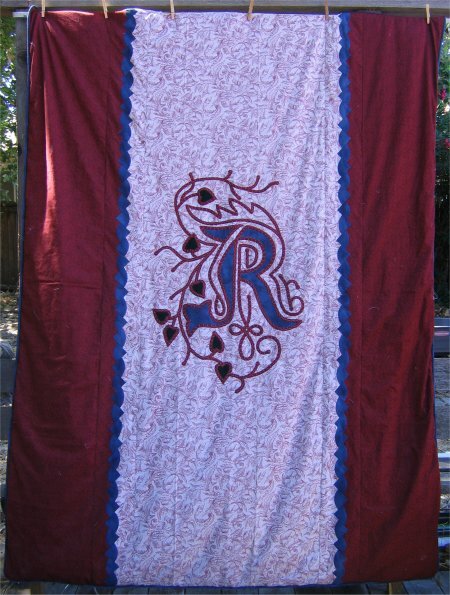 The title "Quilted Letter" is somewhat of a misnomer ... because this is a duvet cover, there isn't any quilting at all. I didn't want the raw seams of the pieced blocks to be exposed on the inside of the duvet cover. When/if she ever washes it, I didn't want to run the risk of threads unraveling, etc, etc. so I put a muslin backing on the front using the sew-n-flip method. The result is the inside of the front is fully finished ... no raw seams showing anywhere. 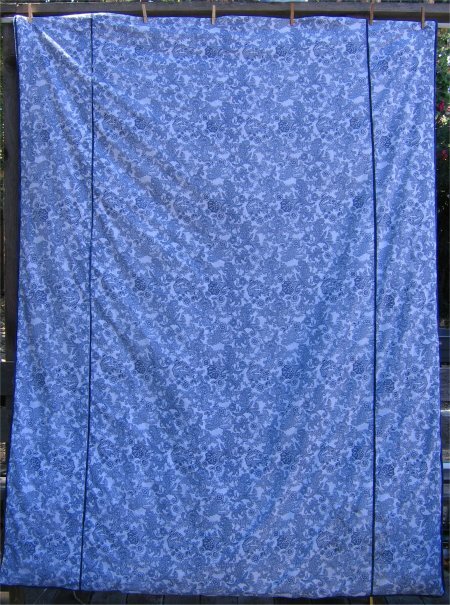 Originally I hadn't wanted to use muslin simply because 3 layers of fabric (front, backing for front and the back of the duvet) would make the cover heavy. But ... I couldn't find any lightweight fabric at a reasonable cost anywhere ... and I already had the muslin. So ... it's a tad heavier than I had wanted but *it's done*! Rene has a big, ol' body pillow that I made a pillow cover for using the original rust & gold lattice fabric and whatever leftover toile I have. As you will see below, I used blue ribbons to create a diamond design. I machine embroidered her initials and "old fashioned" designs in the interiors. 1. full front of the duvet. This is a cover for a twin sized comforter, approximately 86"x88". The comforter is held in place inside the duvet cover by means of ties zig-zagged onto the duvet seam top and bottom seam allowance and loops zig-zagged onto the comforter. In this photo, you can see the body pillow with it's new cover. 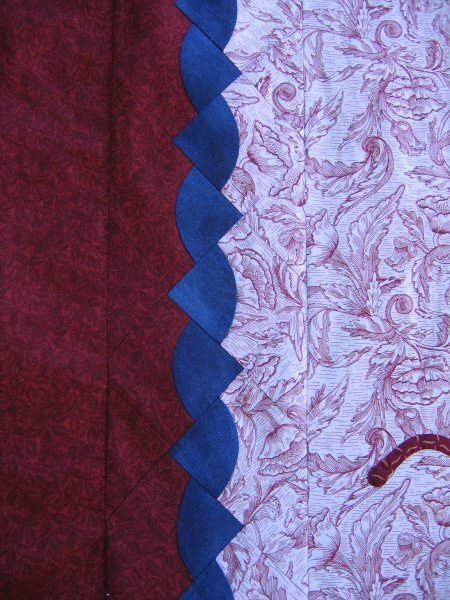 3. close-up of the Drunkard's Path blocks. The finished size of this block is 3". This wasn't my finest work, I'm chagrined to admit ... I mis-measured for the setting triangles, which resulted in the corners being clipped. Fortunately, because it's the same fabric as what it's adjacent to, you can't see if from afar. Just don't look closely at it at all. :-/ I have a CurveMaster foot which made very short work of sewing all those curved seams! 4. full back of the duvet. The center panel is a full width of the yardage. The side panels are somewhat less than half-width. To add interest (but mainly to disguise the fact that I didn't match the fabric print across the seam), I inserted a contrasting fabric flap. The flap was cut 1" wide, folded in half, wrong sides together and sewn with a 1/2" seam, resulting in a 1/4" flap showing.